Ex-WBO super-featherweight champion Barry Jones says he is concerned for the future of fellow Welshman Nathan Cleverly after his latest injury setback. Jones defeated Wilson Palacio on points to win the WBO super featherweight title in 1997 but lost his crown when his licence was revoked by the British Boxing Board of Control after failing a brain scan. He made a return to the ring when his licence was restored and was given a WBO title shot against Brazilian Acelino Freitas in 2000 but his comeback ended in gallant failure. 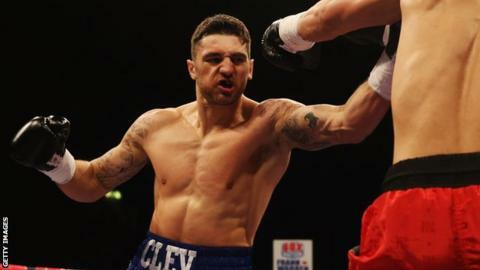 Cleverly's cruiserweight debut has been delayed until the new year after he sustained a back injury. The 26-year-old lost his WBO light-heavyweight title to Sergey Kovalev. "If it's a genuine bad back injury then it could be another six or seven months [and] that's the problem," Jones said. "It's a bit of a setback, not so much that he's had three months off after obviously a devastating defeat but it's how long he has off after this that's the problem." Cleverly, who has won 26 of his 27 fights as a professional, had hinted at retirement after the defeat before announcing a step up in weight. He was due to fight Australian Daniel Ammann for the vacant Commonwealth cruiserweight title at London's Copper Box on Saturday but sustained a back injury in training. "It is a bitter blow as training had been going so well and I was looking forward to making my debut at cruiserweight," Cleverly said.